If you've been reading my blog for a while, you already know that Rick gifted me with a Kindle for my birthday. He also gave me a truly unique present to add to my growing collection of antiques and vintage what-nots -- a Blickensderfer No. 7 typewriter patented in 1897. It is also considered the first portable typewriter, weighing only five pounds. I don't know what it is about antique typewriters that I love so much. Maybe it's because I learned to type at age eight and have been burning up the keys since then. Maybe it's because I like to imagine all the things that have been typed on those keys -- love letters, tearful poems, a great novel. 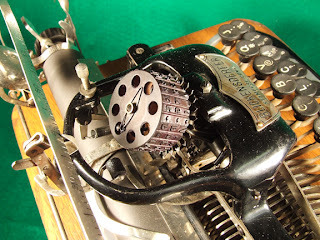 This typewriter came in complete working order, and I wanted to type just a few words on it, to see what it was like. Imagine my confusion when I couldn't find the right letters under my fingers! This typewriter was made with a pre-QWERTY keyboard (QWERTY being the one you are used to now) -- letters just aren't where you expect them to be. 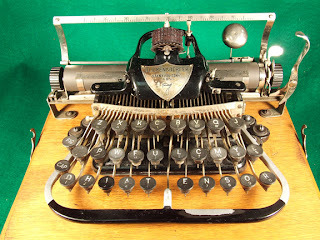 Because it operates with a rotating ball system, there are no keys to get jammed, which is why QWERTY was invented in the first place -- typists got so fast they'd jam two neighboring keys together and gum up the works. ANYWAY. This is my second antique typewriter (my first being a Remington 10 that would break every bone in your foot if you dropped it) and I'm thrilled with it. It's truly, to me, a Pretty Thing. When Lori isn't collecting old things, she's making jewelry for www.lorianderson.net. She also writes the blog "An Artist's Year Off". It is a pretty thing!! What a lovely gift!! I have an antique portable typewriter that used to belong to my great aunt. I need to go look for it in the attic. I have had it for decades and used to use it (pre computer era). I thought you were making some crack about your age...'cause you aren't old! I have a passion for old typewriters as well. I love the look of them, to me they are like art. I have 3 old portable Corona's Circa 1914 they nice and small with celluloid keys. It is cool! We have a guy in our hot shop called typewriter Tim cause of all the old typewriters he buys! 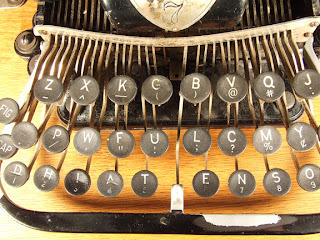 Love the typewriter. I noticed the keys right away! Enjoy your gift. To me....It is a "Cool" thing! Its rather skeletal, yet still beautiful! The keys are in odd places - that would throw you! That is an amazing husband! And typewriter !! What a lovely old typewriter, I got rid of a very old one and although I do have a tiny portable its not as old as that, that is such a neat gift! I remeber learning to type on a dinosaur like this one. They have a certain romatic air about them, don't they? Lori, what a cool typewriter...I'm not sure if I've ever seen one quite like this one. I'd love to buy an old one too some day...for now I just admire them. 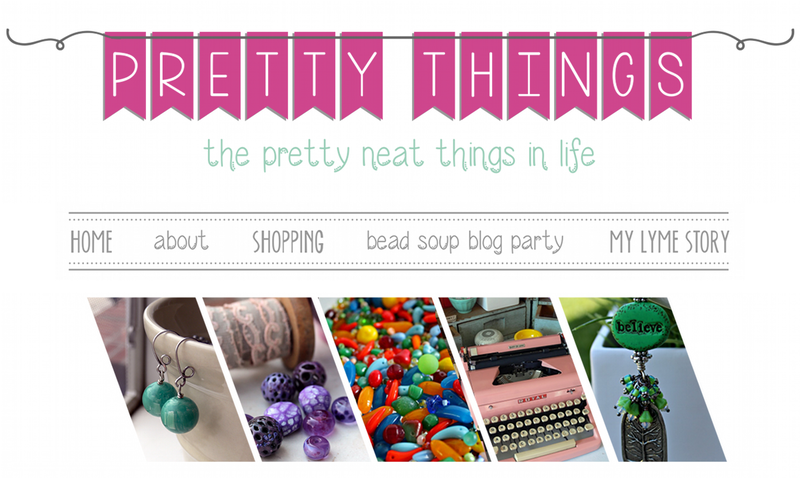 that is one crazy typewriter...beautiful in design..
Bead Soup Blog Party is HERE! 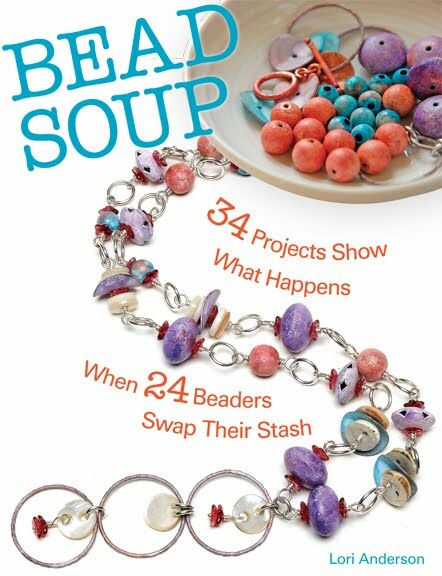 Handmade Beads -- I Make Them! 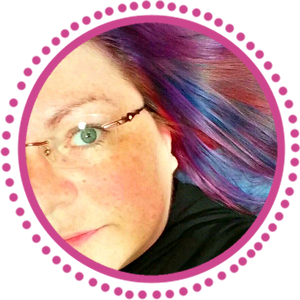 How About Some Color In Your Life? 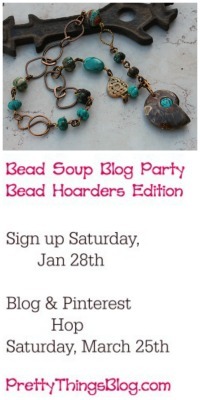 The Next Bead Soup Blog Party is COMING!